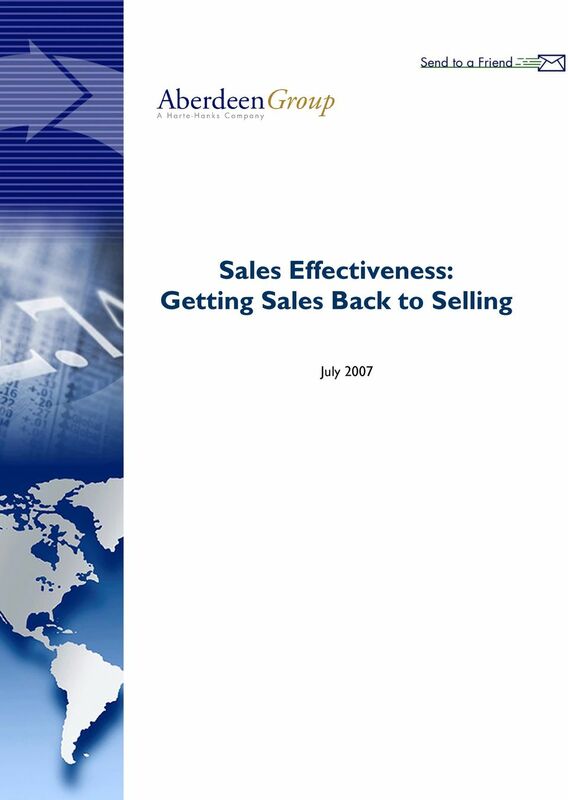 Download "Sales Effectiveness: Getting Sales Back to Selling. 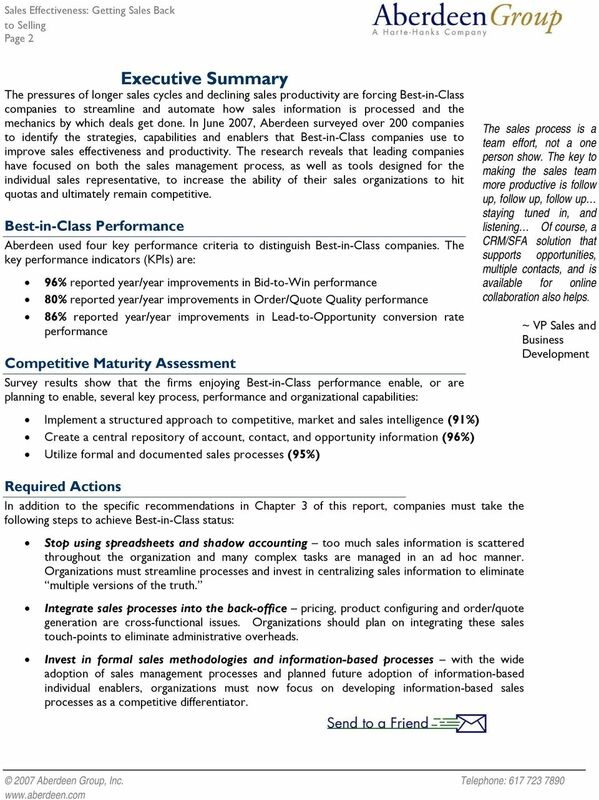 July 2007"
4 Page 4 Chapter One: Benchmarking the Best-in-Class Aberdeen research reveals that companies are increasingly challenged in their sales performance by longer sales cycles and low sales productivity. Specifically, sales teams are missing revenue targets, not hitting quota and facing stalled opportunities as organizations strive to remain competitive and service increasingly discerning customers. 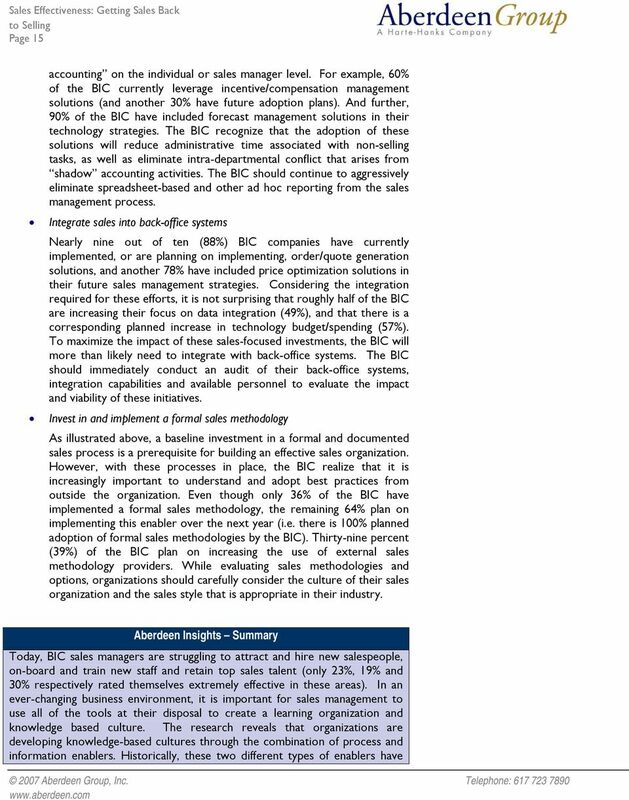 In response to these business challenges, the Best-in-Class (BIC) deploy a combination of actions, capabilities and enablers to their sales representatives to better equip them to effectively manage and execute the sales process. A consistent theme that emerges throughout the research is the propensity to do more with existing resources. For example, the top strategic action taken by Sales Managers is focusing on lead quality (33%), not solely the number of leads coming down the pipeline. In fact, increasing the quantity of leads is rated among the lowest strategic priorities (7%). Instead, Sales Managers are more focused on increasing sales win rates (31%) and improving sales representatives knowledge of products, customer needs and competition (26%). 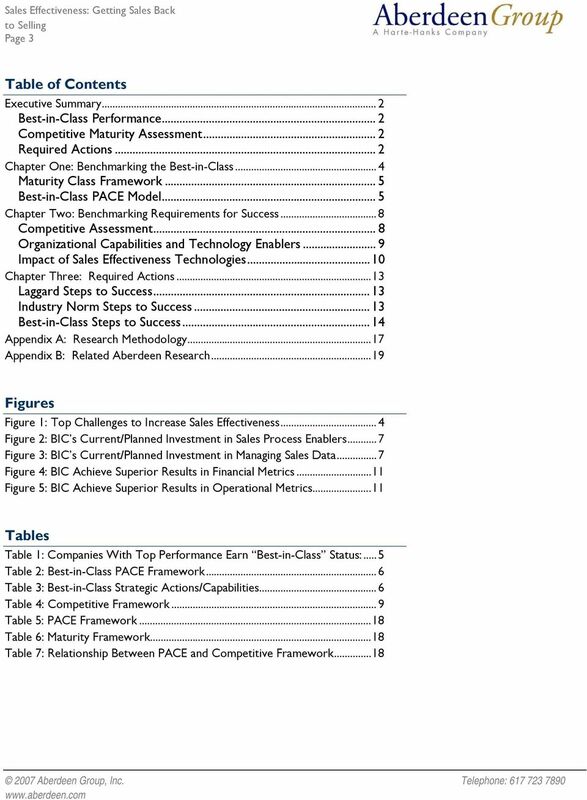 Figure 1: Top Challenges to Increase Sales Effectiveness 80% Fast Facts Best-in-Class firms are nearly 2.5 times as likely as Average firms, and 9 times more likely than Laggards, to report year over year improvements in revenue related sales effectiveness metrics. 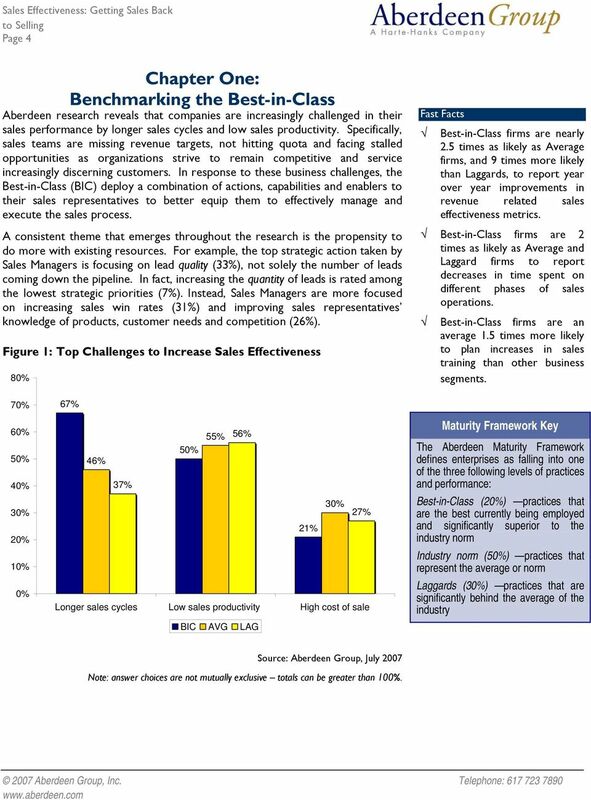 Best-in-Class firms are 2 times as likely as Average and Laggard firms to report decreases in time spent on different phases of sales operations. Best-in-Class firms are an average 1.5 times more likely to plan increases in sales training than other business segments. 70% 60% 50% 40% 30% 20% 10% 0% 67% 55% 56% 50% 46% 37% 30% 27% 21% Longer sales cycles Low sales productivity High cost of sale BIC AVG LAG Maturity Framework Key The Aberdeen Maturity Framework defines enterprises as falling into one of the three following levels of practices and performance: Best-in-Class (20%) practices that are the best currently being employed and significantly superior to the industry norm Industry norm (50%) practices that represent the average or norm Laggards (30%) practices that are significantly behind the average of the industry Source: Aberdeen Group, July 2007 Note: answer choices are not mutually exclusive totals can be greater than 100%. 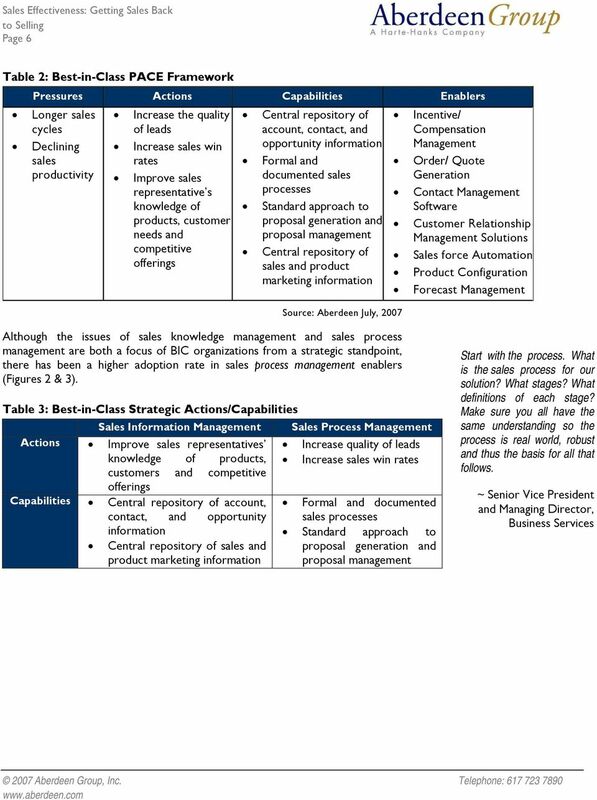 8 Sales Effectiveness: Getting Sales Back Page 8 Chapter Two: Benchmarking Requirements for Success Sales management benefits from formalized sales procedures and automation, and Best-in-Class use these processes and enablers to help sales representatives leverage information on products and consumers. Consequently, the resulting knowledge-based sales organizations are more effective in helping their firms achieve revenue and growth goals. Case Study: Draeger Medical, Inc. Draeger Medical Inc., a leading manufacturer of medical equipment, had been manually computing the commission payments for its 140 commission-based employees. They would extract data from their ERP system and manipulate the information in spreadsheets to compute the various commission payments, a process that was time-consuming and prone to error. They also found that each salesperson was spending as much as 8 hours per week maintaining and reconciling their own personal commission records. This shadow accounting detracted from core selling initiatives, as sales staff worked to ensure that they were being appropriately compensated. The company decided to implement an incentive compensation management system to manage the process more quickly and efficiently. Senior Director of Finance J. Florian Kluge spearheaded the initiative and has seen a dramatic improvement in accuracy rates, reporting speed, and time savings. The sales force loves the system, claims Kluge. Reports are available 24/7, and we don t have to wait over a month to see the computations. In addition to more accurately calculating commission payments, the system allows each user to view their opportunity potential, a feature that has proven to be a strong motivator. But perhaps most important to Kluge: I don t get angry phone calls anymore telling me my check doesn t match! Fast Facts 91% of Best-in-Class firms cite the importance of augmenting CRM/SFA systems with externally sourced information. 89% of Best-in-Class firms leverage or plan to leverage CRM systems integrated with word processing, spreadsheet and applications. 56% of Laggards, compared to 11% of Average firms, do not measure the key sales performance metrics of quota performance, average opportunity size, customer acquisition costs, revenue per account, proposal quality. 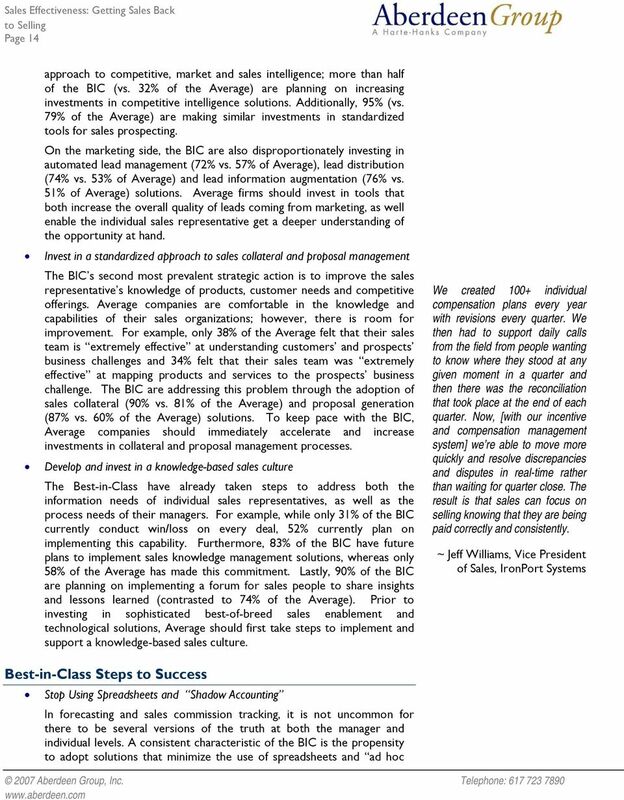 Competitive Assessment The aggregated performance of surveyed companies determined whether they ranked as Best-in-Class, Industry Average or Laggard. 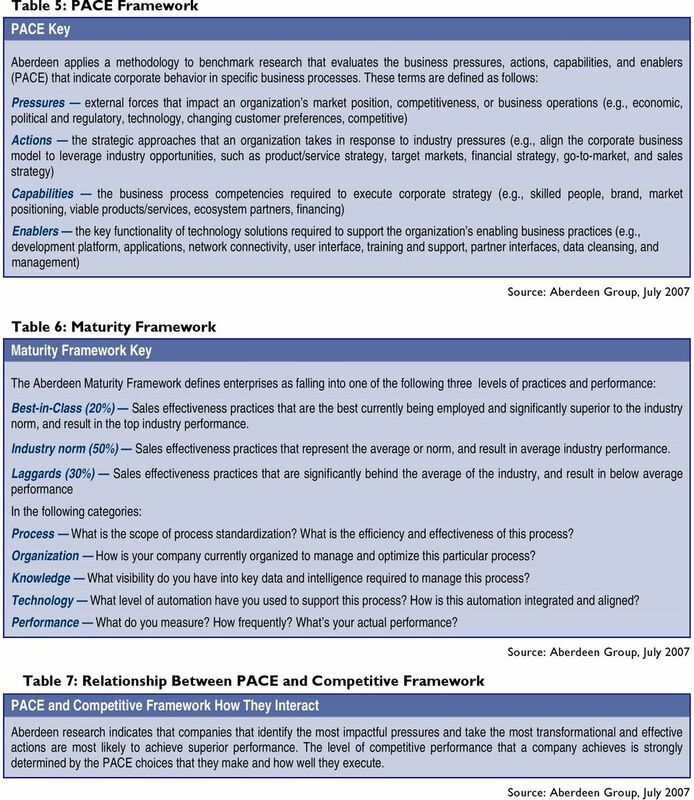 In addition to having common performance levels, each class also shared characteristics in five key categories: 1) process (ability to detect and respond to changing business needs); 2) organization (corporate focus and collaboration among stakeholders); 3) knowledge (contextualizing transaction data and exposing product data to customers); 4) technology (selection or appropriate tools and intelligent deployment of those tools); and 5) performance management (ability of the organization to measure the benefits of technology deployment and use the results to improve key processes further). 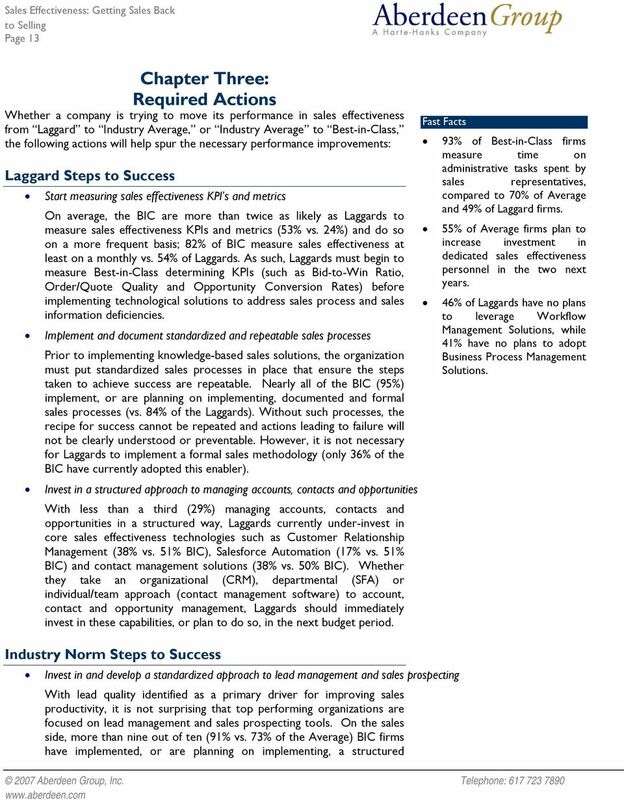 10 Page 10 Average organizations, and 1.4 times more likely than Laggards, to take more formal approaches to proposal generation-management and sales processes. Technology: Tools leveraged by Best-in-Class knowledge-based sales organizations optimize the collection, management and use of information. Best-in-Class firms are 1.3 times more likely than Average organizations to provide, or plan to provide, competitive-market-sales intelligence tools for each sales representative and 2.2 times more likely than Laggards. Best-in-Class firms are also 1.3 times more likely than the other business segments to incorporate CRM software strategies to manage information in the sales process. 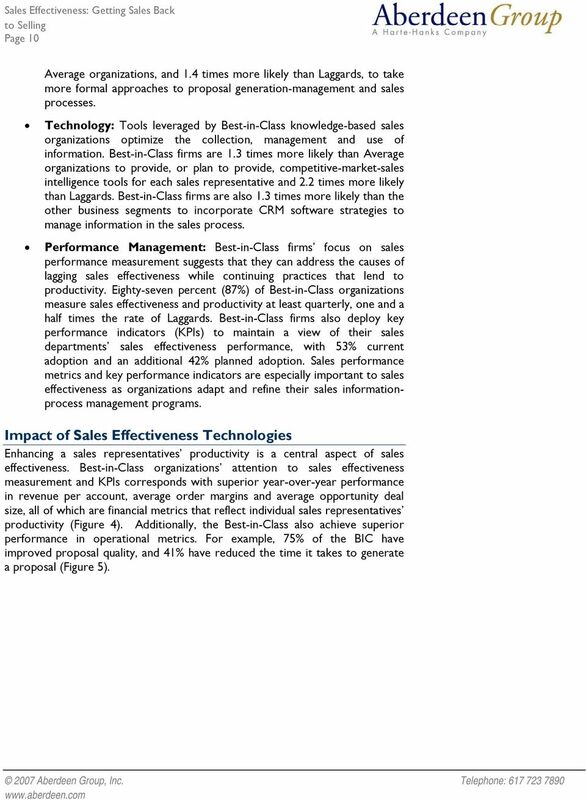 Performance : Best-in-Class firms focus on sales performance measurement suggests that they can address the causes of lagging sales effectiveness while continuing practices that lend to productivity. Eighty-seven percent (87%) of Best-in-Class organizations measure sales effectiveness and productivity at least quarterly, one and a half times the rate of Laggards. Best-in-Class firms also deploy key performance indicators (KPIs) to maintain a view of their sales departments sales effectiveness performance, with 53% current adoption and an additional 42% planned adoption. Sales performance metrics and key performance indicators are especially important to sales effectiveness as organizations adapt and refine their sales informationprocess management programs. Impact of Sales Effectiveness Technologies Enhancing a sales representatives productivity is a central aspect of sales effectiveness. 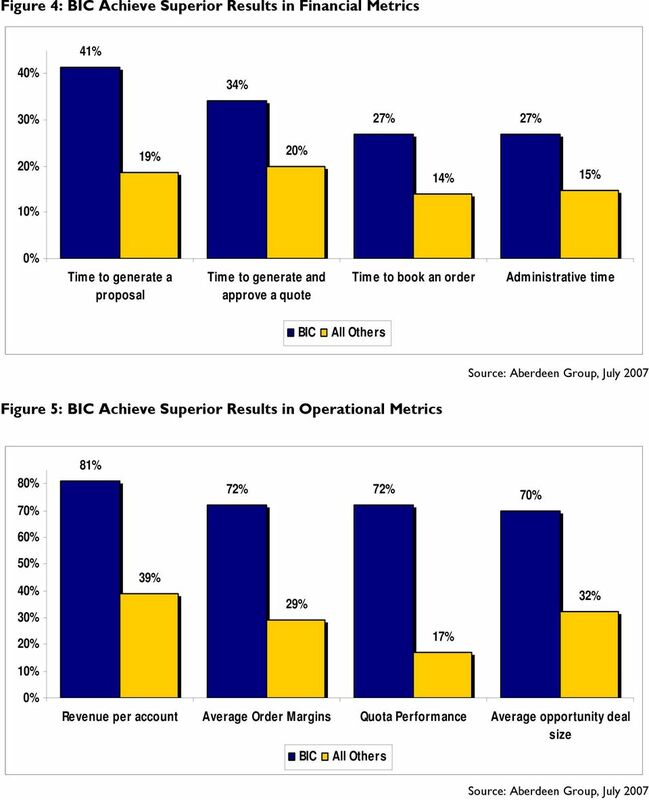 Best-in-Class organizations attention to sales effectiveness measurement and KPIs corresponds with superior year-over-year performance in revenue per account, average order margins and average opportunity deal size, all of which are financial metrics that reflect individual sales representatives productivity (Figure 4). Additionally, the Best-in-Class also achieve superior performance in operational metrics. For example, 75% of the BIC have improved proposal quality, and 41% have reduced the time it takes to generate a proposal (Figure 5). 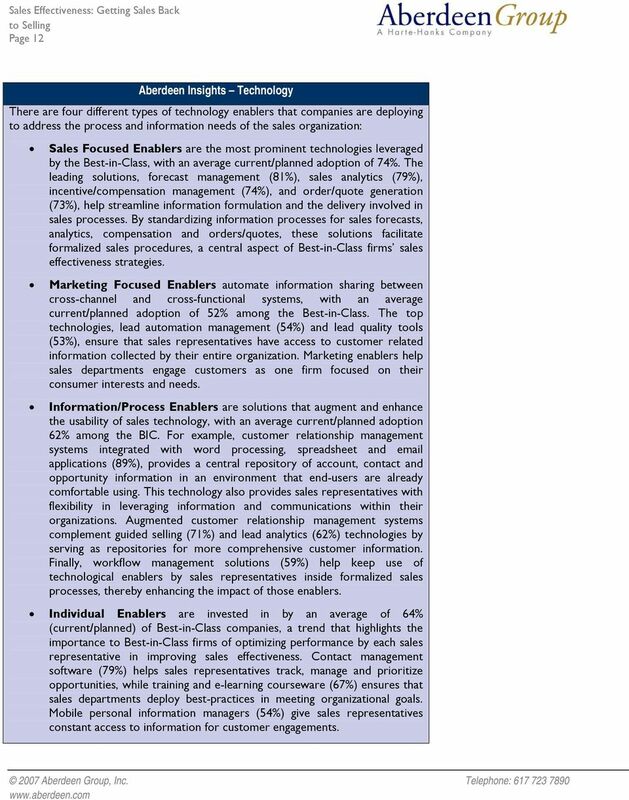 12 Page 12 Aberdeen Insights Technology There are four different types of technology enablers that companies are deploying to address the process and information needs of the sales organization: Sales Focused Enablers are the most prominent technologies leveraged by the Best-in-Class, with an average current/planned adoption of 74%. The leading solutions, forecast management (81%), sales analytics (79%), incentive/compensation management (74%), and order/quote generation (73%), help streamline information formulation and the delivery involved in sales processes. By standardizing information processes for sales forecasts, analytics, compensation and orders/quotes, these solutions facilitate formalized sales procedures, a central aspect of Best-in-Class firms sales effectiveness strategies. Marketing Focused Enablers automate information sharing between cross-channel and cross-functional systems, with an average current/planned adoption of 52% among the Best-in-Class. 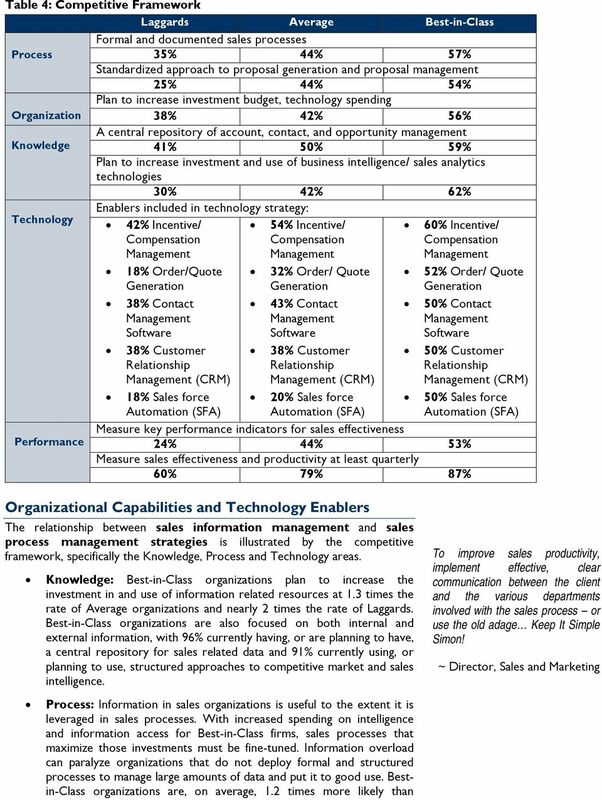 The top technologies, lead automation management (54%) and lead quality tools (53%), ensure that sales representatives have access to customer related information collected by their entire organization. Marketing enablers help sales departments engage customers as one firm focused on their consumer interests and needs. Information/Process Enablers are solutions that augment and enhance the usability of sales technology, with an average current/planned adoption 62% among the BIC. For example, customer relationship management systems integrated with word processing, spreadsheet and applications (89%), provides a central repository of account, contact and opportunity information in an environment that end-users are already comfortable using. This technology also provides sales representatives with flexibility in leveraging information and communications within their organizations. Augmented customer relationship management systems complement guided selling (71%) and lead analytics (62%) technologies by serving as repositories for more comprehensive customer information. Finally, workflow management solutions (59%) help keep use of technological enablers by sales representatives inside formalized sales processes, thereby enhancing the impact of those enablers. 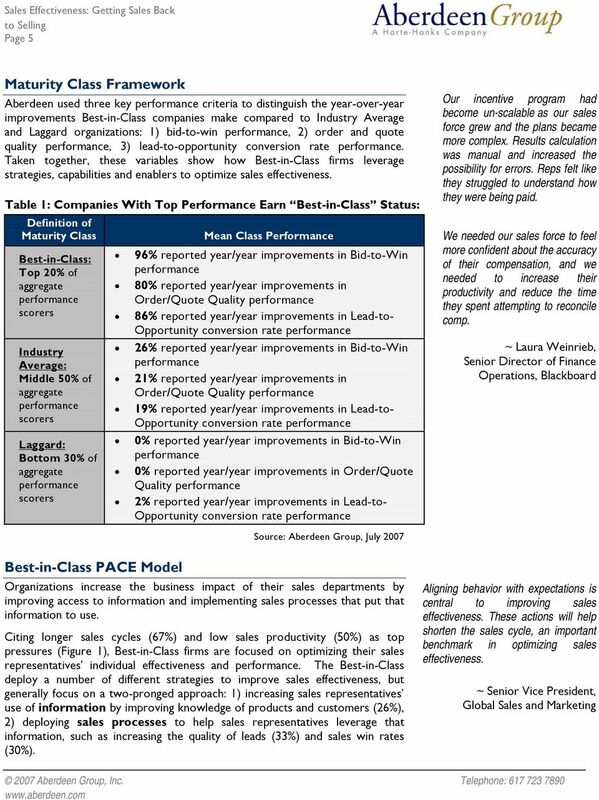 Individual Enablers are invested in by an average of 64% (current/planned) of Best-in-Class companies, a trend that highlights the importance to Best-in-Class firms of optimizing performance by each sales representative in improving sales effectiveness. Contact management software (79%) helps sales representatives track, manage and prioritize opportunities, while training and e-learning courseware (67%) ensures that sales departments deploy best-practices in meeting organizational goals. Mobile personal information managers (54%) give sales representatives constant access to information for customer engagements. 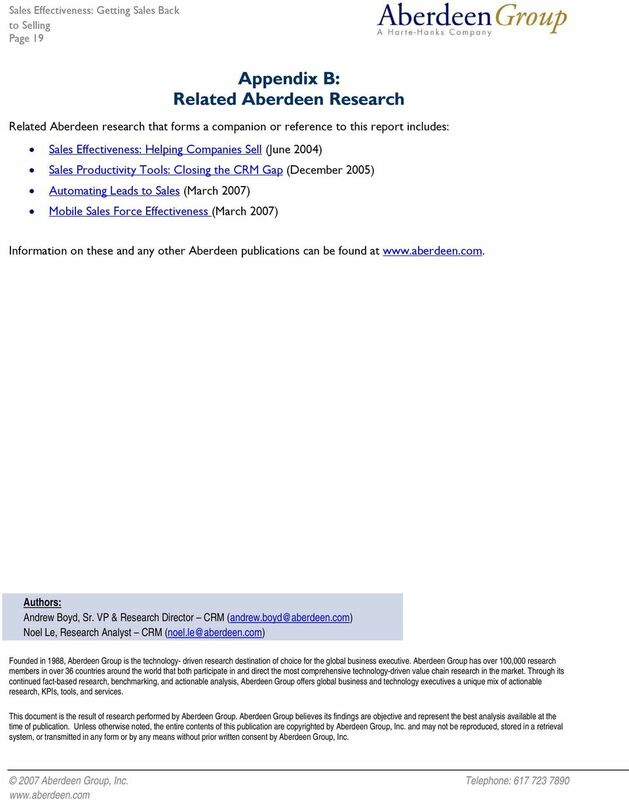 16 Page 16 Aberdeen Insights Summary been mutually exclusive; however, the research also suggests that there is currently a convergence of the two underway. 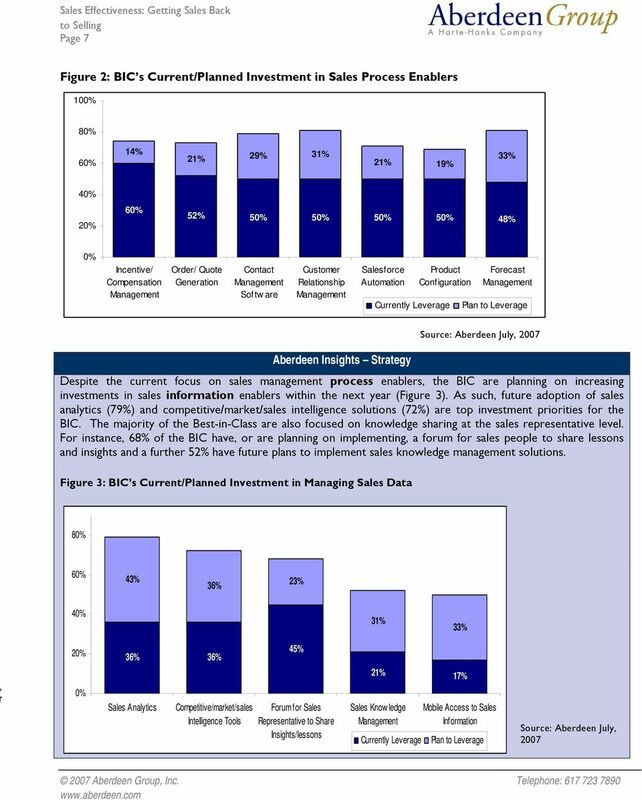 For example, in implementing formal sales methodologies, 92% of the BIC have included guided selling in their future sales management strategies and 63% of the BIC plan on increasing the use of in-product training that is, sales methodologies and mentoring within a CRM or SFA system. These types of enablers are information-based, yet process driven. As process enablers move to ubiquity, and information enablers become more prevalent, leading organizations will undoubtedly develop new and differentiating information processes. 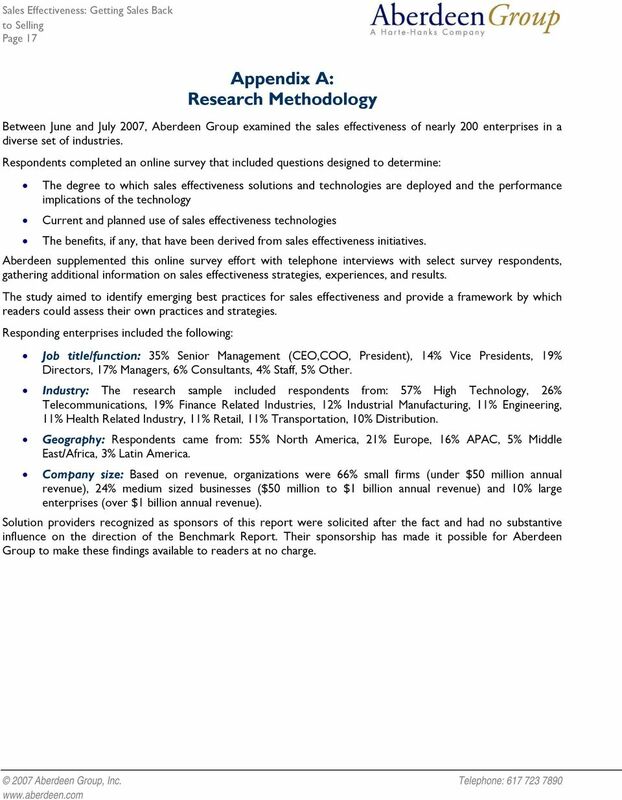 17 Page 17 Appendix A: Research Methodology Between June and July 2007, Aberdeen Group examined the sales effectiveness of nearly 200 enterprises in a diverse set of industries. 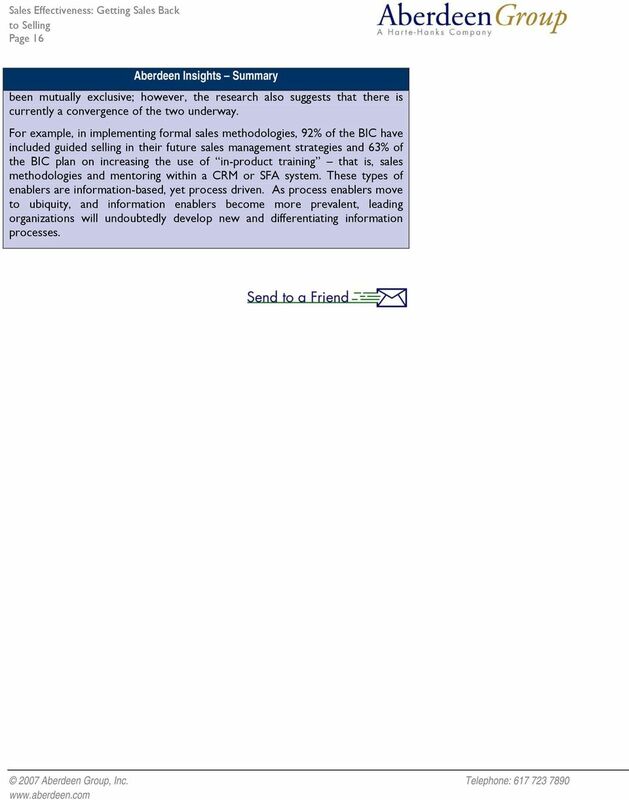 Respondents completed an online survey that included questions designed to determine: The degree to which sales effectiveness solutions and technologies are deployed and the performance implications of the technology Current and planned use of sales effectiveness technologies The benefits, if any, that have been derived from sales effectiveness initiatives. Aberdeen supplemented this online survey effort with telephone interviews with select survey respondents, gathering additional information on sales effectiveness strategies, experiences, and results. The study aimed to identify emerging best practices for sales effectiveness and provide a framework by which readers could assess their own practices and strategies. Responding enterprises included the following: Job title/function: 35% Senior (CEO,COO, President), 14% Vice Presidents, 19% Directors, 17% Managers, 6% Consultants, 4% Staff, 5% Other. Industry: The research sample included respondents from: 57% High Technology, 26% Telecommunications, 19% Finance Related Industries, 12% Industrial Manufacturing, 11% Engineering, 11% Health Related Industry, 11% Retail, 11% Transportation, 10% Distribution. Geography: Respondents came from: 55% North America, 21% Europe, 16% APAC, 5% Middle East/Africa, 3% Latin America. Company size: Based on revenue, organizations were 66% small firms (under $50 million annual revenue), 24% medium sized businesses ($50 million to $1 billion annual revenue) and 10% large enterprises (over $1 billion annual revenue). Solution providers recognized as sponsors of this report were solicited after the fact and had no substantive influence on the direction of the Benchmark Report. Their sponsorship has made it possible for Aberdeen Group to make these findings available to readers at no charge. 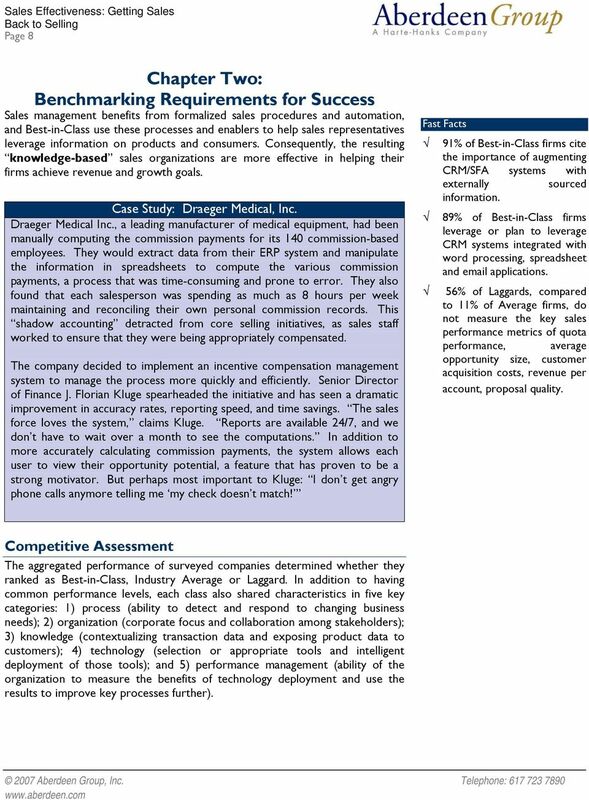 19 Page 19 Appendix B: Related Aberdeen Research Related Aberdeen research that forms a companion or reference to this report includes: Sales Effectiveness: Helping Companies Sell (June 2004) Sales Productivity Tools: Closing the CRM Gap (December 2005) Automating Leads to Sales (March 2007) Mobile Sales Force Effectiveness (March 2007) Information on these and any other Aberdeen publications can be found at. Authors: Andrew Boyd, Sr. VP & Research Director CRM Noel Le, Research Analyst CRM Founded in 1988, Aberdeen Group is the technology- driven research destination of choice for the global business executive. Aberdeen Group has over 100,000 research members in over 36 countries around the world that both participate in and direct the most comprehensive technology-driven value chain research in the market. Through its continued fact-based research, benchmarking, and actionable analysis, Aberdeen Group offers global business and technology executives a unique mix of actionable research, KPIs, tools, and services. This document is the result of research performed by Aberdeen Group. Aberdeen Group believes its findings are objective and represent the best analysis available at the time of publication. Unless otherwise noted, the entire contents of this publication are copyrighted by Aberdeen Group, Inc. and may not be reproduced, stored in a retrieval system, or transmitted in any form or by any means without prior written consent by Aberdeen Group, Inc. Sales Transformation How World-Class is your Company s Sales Strategy, Organization & Talent? Why is it so difficult to grow revenue, identify emerging customers and partners, and expand into new markets through the indirect sales channel? Aviso s Sales Forecasting Maturity Model: Where do you stack up?